What Will Apple Announce at Their Music-Centric September 1 Event? Apple has finally made their September event official, and it's coming sooner than many expected—the "special event" will be held September 1 in San Francisco, and from the look of things it's going to involve music. So what are they going to announce? Some things, like new iPods, are a near lock. Others, like a cloud-enhanced iTunes, are a bit more hazy. Here are some possibilities. • New, Facetime-ready iPod Touches? Everyone's been expecting Apple to expand Facetime to other devices, and the iPod Touch, primed for an update, seems like a logical first step. We heard a few months ago that iPod Touches would use email addresses for Facetime calls, and a slew of leaked parts, some more convincing than others, have all shown that the iPod Touch would bear at least a front facing camera. Macrumors hears it's slightly thinner than older iPod Touches, with a less curvy back. Is This Video of the 4th-Gen iPod Touch LCD? • A 1.7" touch screen iPod Shuffle? This one seems likely, too, and some accessories have leaked out a bit early, making the very nano iPod Nano seem like a near-certainty. Is This the Next iPod Shuffle? • The feverishly anticipated cloud-enhanced iTunes? It's sad to say, but a full-on cloud-based iTunes still seems like it might be a ways off. Apparently Apple has not approached record labels about the new licenses they'd likely need to store and serve MP3s from their own severs, and some recent reports have said that tomorrow's iTunes updates are primed to be more social than stream-y. • 60 second previews for iTunes songs, doubling the length of the current 30 second clips? If so, this is a hint of what's to come with Apple's eventual streaming offerings. Whereas good old Lala gave you a chance to stream the full song once, Apple might only deign to let you hear a minute of a tune for previewing purposes. • The long-rumored $99 Apple TV? For a while it seemed like an AppleTV update was a lock for tomorrow's event, but the explicitly music-themed event invite suggests that any AppleTV updates in the works might be bumped for another day. Still, rumors are reaching a critical mass and we could well see Apple's new living room play announced on the First. • 99 cent TV show rentals through Apple TV? While AppleTV hardware seems increasingly unlikely for tomorrow's event—though still a distinct "One more thing" possibility—some sort of video streaming service is possible. CNET heard that the Lala team was working on a some sort of video streaming feature that was holding things up, and it's possible we could hear about that tomorrow. Update: The WSJ says Apple will have 99-cent rentals from ABC and Fox. 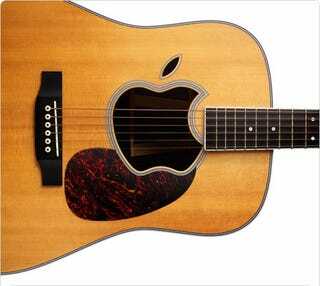 The Apple-sound-hole-guitar suggests that Apple's music making products might get updates—perhaps new versions of Logic and Garage Band? I certainly wouldn't mind if they were overhauled to take advantage of the Magic Trackpad's multitouch goodness. Or how about Garage Band for the iPad? Hell, I'd just take some news on the iPad's jump to iOS 4.whatever. And perhaps at this event we'll finally find out the answer to the mystifying question: Why on Earth did Lady Gaga visit the Apple offices? If Gaga and Steve Jobs appeared on stage together, the combined reality distortion would be so great that I'm not sure our planet would ever recover.